It's been over a week since Avengers: Infinity War took over cinemas worldwide (our entire lives, really) and we don't blame you if you're so into the Marvel hype. But tbh, two of our favorite Avengers—Black Widow/Natasha Romanova (Scarlett Johansson) and Captain America/Steve Rogers (Chris Evans)—were seriously underutilized in the film, so here is a much-deserved appreciation post for these on-and-off-screen besties. As we all know, Natasha has (almost) always been on Team Cap. In an interview with Marvel Studios, Scarlett talks about Natasha and Steve's teamwork leading up to Infinity War. "I think Steve and Natasha have a very fluid communication between them," says Scarlett "They've obviously been on hundreds of missions together, in life or death situations. They operate very much like teammates. It's a kind of unspoken communication that they have at this point." 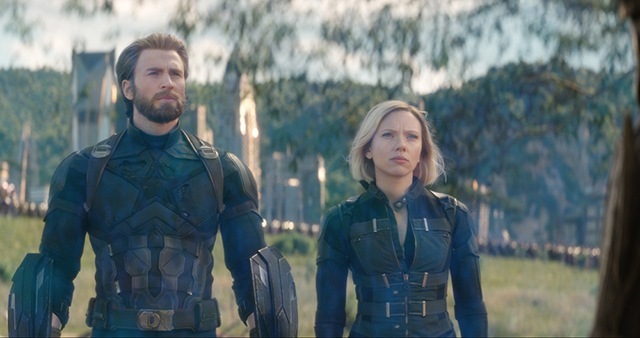 Chris agrees and says of their tandem, "She and Cap are trying to monitor and take care of as much as they possibly can without having the structure that they had in the safety of the Avengers." The two first shared the screen in the 2004 teen film The Perfect Score as high school seniors plotting to cheat on their SATs. They were SO. YOUNG. The next was in 2007's The Nanny Diaries, a rom-com that still makes us ~*kilig*~ up to this day. "I know him very well—too well," Scarlett said of her bestie on The Ellen Show right before he gave her a surprise scare. SO CUTE! Srsly, can't Avengers 4 come any sooner? We need our dose of ScarJo + Evans!